Bath Iron Works has been awarded a $3.9 billion contract to build four Arleigh Burke-class destroyers, one per year from 2019 through 2022. “We are pleased with the opportunity for Bath Iron Works to continue our operation in the DDG 51 Program and to deliver much needed capability to our U.S. Navy customer,” BIW President Dirk Lesko said. The Bath shipyard will split a total of 10 destroyers with competitor Huntington Ingalls of Pascagoula, Mississippi: four to BIW and six to Ingalls. The two shipyards have traditionally split the construction of Arleigh Burke-class destroyers roughly evenly. 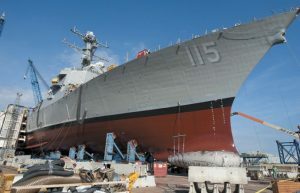 BIW had no comment on Ingalls getting two more destroyers than Bath. While the contract is for $3.9 billion, if all options are exercised, the contract could be worth $4 billion total. The contract also includes the possibility for BIW to compete for five additional destroyers, one per year from 2018-22. The Navy had 64 Arleigh Burke-class destroyers in 2017. There are four Arleigh Burke-class destroyers in production at BIW. The Arleigh Burke-class destroyer has been the core of BIW’s production for decades. The shipyard has been building the destroyers almost continuously since 1988. The program was halted briefly in the mid-2000s with the intention of replacing them with the highly advanced Zumwalt-class destroyers. Faced with higher costs and difficulties of incorporating new technologies into the new stealth destroyers, the Navy quickly backtracked, however, and in 2009 announced that it would limit the production of Zumwalt-class destroyers to three ships and restart the Arleigh Burke-class destroyers, albeit with some updates. The new contract would keep BIW roughly at the same rate of production for Arleigh Burke-class destroyers as it has been for several years. With the completion of the third and final Zumwalt-class destroyer in sight, however, the shipyard is looking for a new contract that can replace that work. To that end, the company has placed a bid to build the Navy’s new frigate. If BIW were to win the contract, it could give the shipyard up to 20 additional ships to build in the coming years. With procurement for those vessels starting in 2020, the shipyard would produce two ships per year, in addition to its Arleigh Burke-class destroyers.